One of W.P. Weston’s great themes was that of trees, and this transcendent panorama of an ancient fir clinging to a rocky cliff overlooking the sea is a superb example. Weston stated, “I like the trees that have had a struggle, and that’s why I like to paint the trees along the seashore and up on the mountains. They’re like people who have had to fight to live; they’ve developed character.” Reminiscent of Japanese bonsai, here nature itself has shaped and trimmed this tree into a striking work of art. Weston sought out these beautiful and desolate scenes; he did not put people in his paintings, feeling that nature was enough. His strong sense of design is imbued in every element. The swirling rings of the sea’s tidal movement, the distant mountains on the horizon, the arching movement of the sky to the focal point of the wind-sculpted tree create a stunning scene. 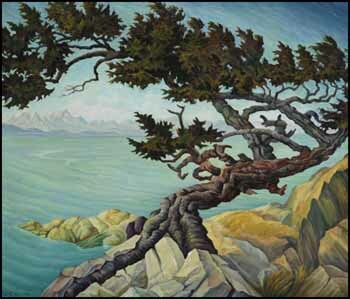 In 1937, Weston produced a larger canvas of this scene entitled Windswept (Old Fir, Albert Head). He must have found it compelling to paint it once more.